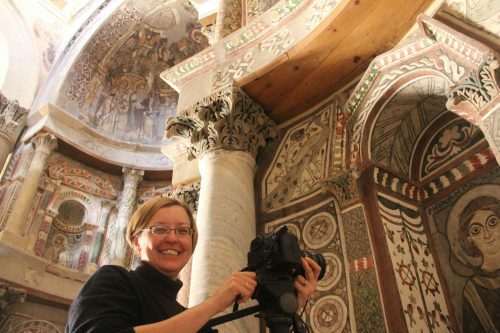 The 2018 Medieval Academy Digital Humanities and Multimedia Studies Prize has been awarded to Professor Elizabeth Bolman for her project “The Digital Red Monastery Church: Open Access for Scholars and the Public, for Research and Teaching”. Bolman is Else B. Smith Professor in the Liberal Arts and Chair of the Department of Art History and Art. This project used laser technology not only to create an interactive 360-degree panorama of the triconch sanctuary for the use of the general public, but also a highly sophisticated, finely grained laser scan of the entire church that preserves its current structure for future study. The DHMS Prize honors successful and innovative digital projects in Medieval Studies. The recipient (i.e. the Principal Investigator) will receive an award of $1000, to be presented at the upcoming Annual Meeting in Atlanta.